There cannot never be two opinions on the idea that our today will determine our tomorrow. For instance, the thinking and ideology that we will move forward from here, the same ideology will affect the tomorrow of the society and country. Today if you neutrally observe and intensively study the youth from social media to university platform, you will find them discussing social, economic and political issues. You will see a great change right away. The youth will appear as the serious thinker, but later the same youth will be somewhat different. For them, is, read books, learn new things, but leave them before entering the house and society. Hereby, we classify the youth in four parts. The first youth is a thinker but cannot do anything. The other is a thinker but he does not want to do anything. The third youth is anxious and contemplative but wants an opportunity for himself. After this, there is a fourth kind of youth who is different from all these. He has no thinking and thought the pattern for his own. He is just standing in the form of a crowd, which is being used and exploited by all the people. Today, one ideology that is teaching the youth is that the root cause of all problems is religion and caste. But its solution is apparently not visible at all. I personally believe that the interference of religion and caste cannot be denied in many social problems. But the intervention will be actually of the political religion and caste. Where this political religion was to suggest ways to get out of the problem, the intellectuals and thinkers are just busy in mopping their own floor with this debate. Regrettably, by losing their intellectual balance, senior journalists are also cheering on this politics. The people who follow him on social media are eager to worship him. 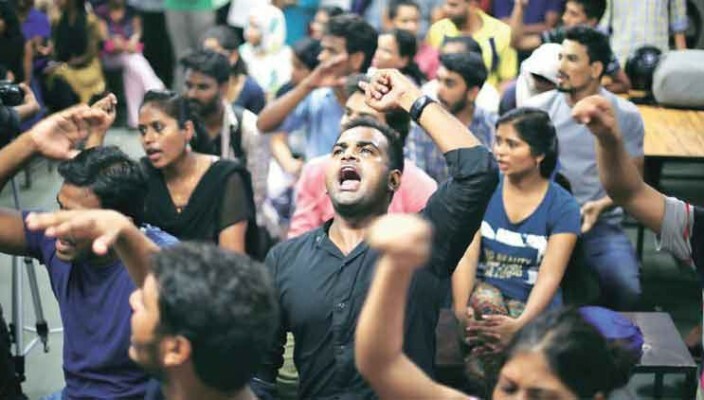 Where national ideology was to be taken ahead, in the name of ideology itself, the youth was divided into three parts- On one side is the left wing. On the other hand, the Right Wing and the third is the young who believes in the fictional history and folk tales, filled with self-conceit. Amazingly, all the three types are convinced with their own ideology as their ultimate reality. Actually, the fight that is being presented before the youth today have been over long ago but the dead nails are being thrown in front of youth again and again, for instance-How did Nehru and Patel relate?, Why Bhagat Singh’s lawsuit was fought by people associated with Congress, how much the Sangh participated in the freedom struggle?, Ambedkar was the leader of which caste?, why did not Gandhiji read the Gita in the mosque etc. -e.t.c. Can these issues teach us to deal with the disaster of the future, related to water conservation, air pollution, increasing hunger, unemployment, and population? Marks, Mao, Lenin, Che Guevara, they may have the solution to the problem of the past but they cannot solve the problems of the future. Every single time, new problems arise in every new era, so their solutions will also have to find new ones. There are racist problems, but will it get solved by merely talking about this problem, doing politics on it or shedding of tears? No! Because our past thousands of years are submerged into it. Yes, we can forget this problem and try being together to solve the next problems, that can perhaps help to end the problem itself. But the problems and disputes are being dispelled from the past and distributed to the youth. The people who make the world danced in the name of ideas, will continue to discuss the incidents of Bhima, Koregaon, Haldighati. And, whenever we will need weapons to balance the country, they will sell weapons; when we want to calm down and move ahead then they will again give the issues of the past. Try to understand that our youth is being wrapped in ideologies. The quotes like- eat, drink and forget everything is being sold to it. But people understand that if there are only people who enjoy and drinking, then who is doing new modern inventions of science and technology and researching on new diseases? Actually, this is the attack of thoughts that has always happened in the world which led to enslaving and disappearing of many civilizations. The idea is to open others in the name of happiness and get themselves occupied in their place. That is, an absurd force runs the world. Many times, things are desired or guided in the way they fall, firstly the people of weak ideology are affected. If you don’t agree then just see that many terrorist organizations around the world today are trying to frighten the world just to seek the land for their own ideas on which they believe to carry their proprietary rights. They do not care about the results, nor do they care whether the war is justified or illegitimate? They are ready to go to any extent. They also succeed because they know that most young people rely on the ideas that will be given to them. Young people need to give powers to the nation. Political problems presented in front of us today are not as big as they are shown. Our real problem is in the form of the scarcity of natural sources, and resources in the future. Therefore, the youth should fight their new enemies by keeping their work in harmony. It is their victory that the past war will be buried in the past. If they have any kind of suspicion then there are two ways to understand any thoughts stream, first read the literature of that ideology, and second is closely observing the followers of the other ideology, everything will be exposed in front of them, and they will understand that how they are being entangled in the web of ideologies.